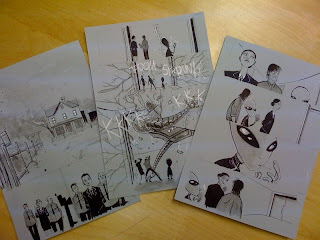 Ben T. was kind enough to gift me these three pages from our upcoming GROOM LAKE #1. The first issue's done and I'll definitely show some finished pages off soon enough, but for now, this works as a nice glimpse at what's to come. Been waiting to see some of this. And Ben's art looks great at this pre-color/texture stage. Looks so sharp. Can anyone give a quick summary about what this is about? That art looks pretty dang cool. >Can anyone give a quick summary about what this is about? That art looks pretty dang cool.